The ancient myth of Psyche and Cupid is an enduring tale of love and trust, and has been a popular motif in painting, sculpture, and jewelry for thousands of years. 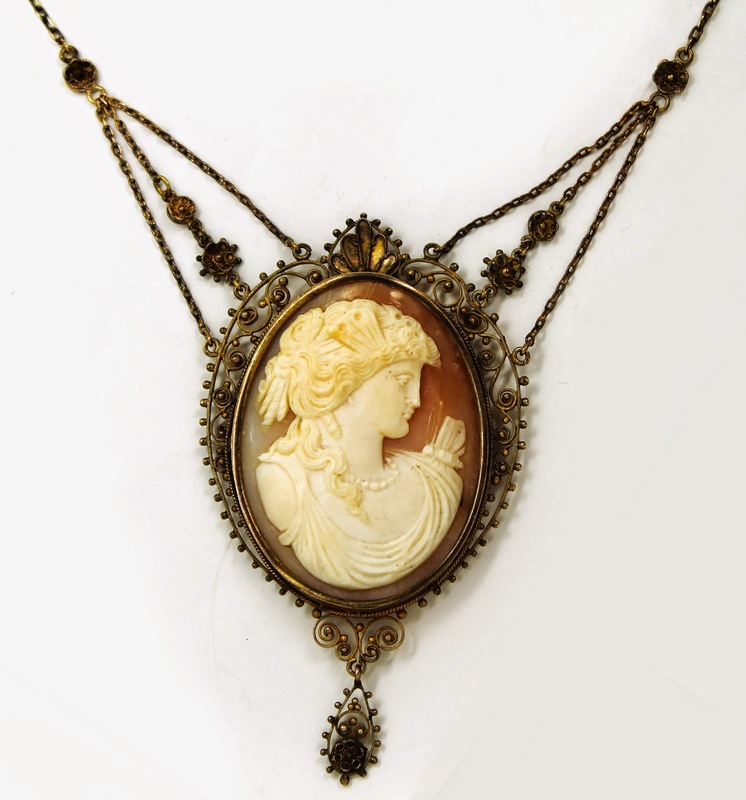 Psyche and Cupid is one my my favorite themes in jewelry, and I'd like to show off a few pieces we've found. Psyche was the youngest and most beautiful daughter of the rulers of an unnamed city in ancient Greece. Her beauty was so great that the citizens of the city began to worship Psyche instead of (properly) worshiping Venus (Aphrodite), the goddess of love and beauty. Venus was offended that a mortal woman has usurped her rightful devotees and sent her son Cupid (Eros), the god of desire, to work her revenge. Venus ordered Cupid to shoot Psyche with one of his arrows and force her to fall in love with the most hideous monster he can find. When Cupid saw Psyche, he dropped the arrow meant for her and scratched himself instead, falling deeply and passionately in love with the beautiful young woman. parents were unable to find anyone to marry her. Fearful that their family had incurred the displeasure of the gods, the king and queen consulted an oracle and were told that Psyche had been fated to marry a monster. She was to be taken to the top of a mountain and left there to meet her fate. The West Wind spirited Psyche away to a beautiful palace with invisible servants. Every night, her husband visted her in the darkness and warned her that she must never try to see him. Although her invisible husband was kind, Psyche grew homesick. She persuaded her husband to allow her sisters to visit and lift her spirits. When her sisters arrived, however, they were overcome with jealousy. When the sisters learned Psyche had been warned never to try to see her invisible husband, they persuaded her that her husband must be a horrific monster. The sisters gave Psyche a candle and a knife, telling her that she must kill her husband before he killed her. Psyche's invisible husband came to visit her in the night as usual. When he fell asleep, she took up the candle and knife. To her shock, the light revealed the most beautiful young man she had ever seen: Cupid. In her surprise, Psyche dripped hot wax on Cupid's shoulder, awakening him. Cupid immediately fled the opulent palace and his confused, despairing wife. Psyche wandered the countryside looking for her husband, finally seeking out the help of Venus in desperation. Venus set many trials and tribulations for Psyche to endure, but Psyche's kind heart and gentle nature invariably led her to find help to pass each trial successfully. When Cupid heard that his wife was in the power of his spiteful mother, he appealed to Venus to stop her persecution. At long last, the pair were reunited and Psyche was anointed a goddess in her own right. And they lived happily ever after. Psyche is almost always depicted with butterfly wings, although wings are never actually mentioned in the myth. Many of the cameos that depict Psyche will show her with butterfly wings in her hair, or with butterflies surrounding her. The butterfly symbolizes the soul in many mythologies, and is a key part in Psyche's symbolic tradition. The story of Cupid and Psyche is a wonderful myth. On its surface, it is a story of love that begins in mistrust and yet eventually conquers any number of difficulties. It can also be read as an allegory for the soul, its struggles and resurrection. 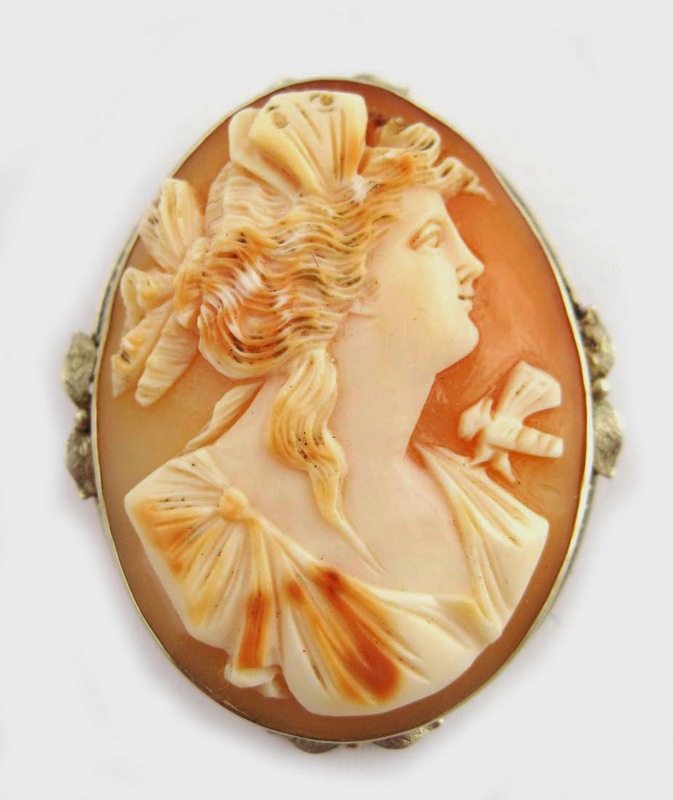 It's a wonderful motif for jewelry: depicting female and male beauty, with a deeper meaning for those who look for it. 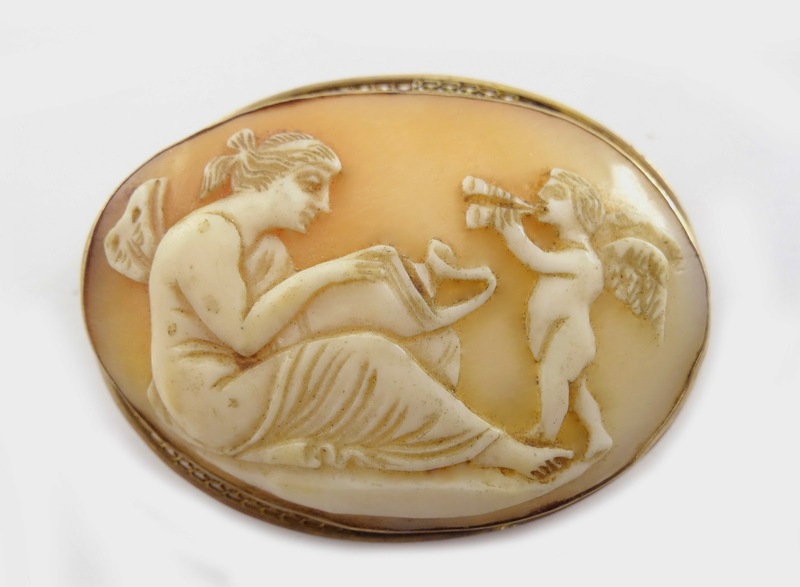 We have seen several beautiful pieces of antique jewelry with the Cupid and Psyche theme. 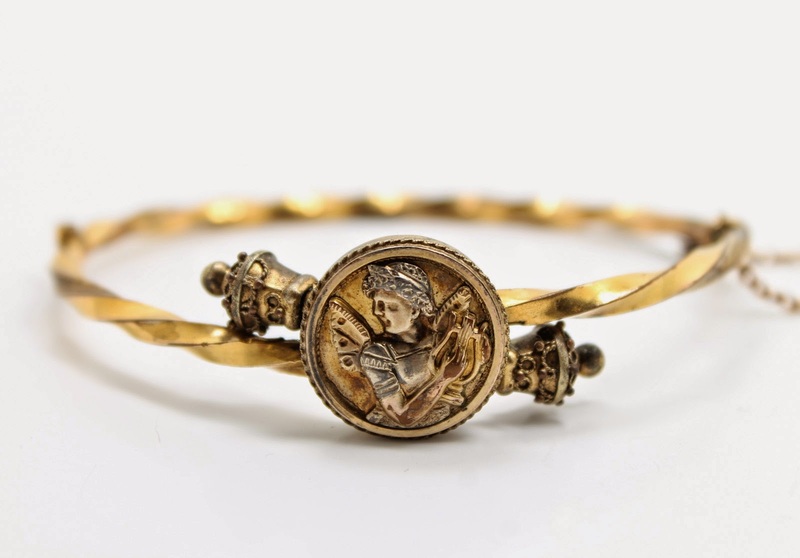 One of my current favorites is this Victorian era bracelet with a small medallion depicting butterfly-winged Psyche holding a lyre (one of Cupid's attributes). To see more antique jewelry, check out our store.